Your commercial air conditioning system is important and you want to keep it running for as long as possible. In order to do that, you have to properly maintain it. The below commercial air conditioning maintenance tips should help you out. Your AC has a filter and it needs to be cleaned, especially if you use your system regularly. When your air filter is too dirty or it becomes obstructed, then the amount of air that the system intakes is decreased. At the same time, more electricity is used because the AC is working harder to cool down the room. As a general rule of thumb, clean the filter every two weeks. If your commercial AC is turned on virtually all the time, then you should clean the filter once per week. Use a vacuum cleaner to clean the filter or use lukewarm water mixed with detergent if the filter has a bit of soil built up. Some commercial AC systems do have automatic filter cleaning features, so use it if yours does. Not only do you want to clean the filter, but you should clean the cooling fan. This is typically located in the back. Cleaning the fan regularly offers a number of benefits, such as keeping electric bills low. Before the hot weather arrives, check the fan and see if it needs to be cleaned. If there is a lot of dirt built up, then contact a professional. They will thoroughly clean it, but if it's only a little dirty, then you should be able to wipe it down with a cloth. Have a look at the refrigerant levels. If needs be, refill them up to proper levels or have it flushed and replaced. However, if it continues to become low, the chances are there is a leak present and you should have it fixed as soon as possible. Inspect the wiring of your commercial AC system. Depending on what kind of business you run, there might be a chance rodents have ate through your wires or your wiring is at risk. Besides that, it's just good practice to check the wires on a regular basis and to replace them when they are visibly and noticeably damaged. If you are not an expert, then make sure you hire a professional to replace the wiring. Inspect the condenser because sometimes the coils can become clogged due to debris that has fallen into it. Snow and other types of bad weather can cause damage to the coils too. If there is any debris located in the condenser, then remove it and if there are things that are bent, then straighten them out. Don't forget to clean the coils with soap and water. The above commercial air conditioning maintenance tips will keep your AC system running at optimal performance. 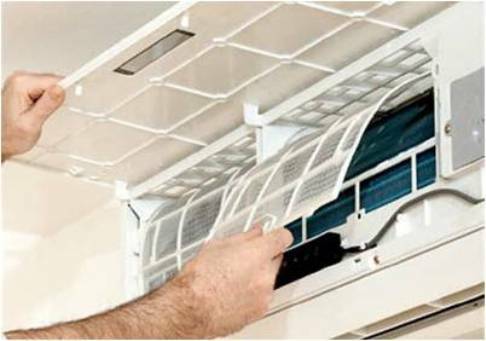 Cleaning the filter, the cooling fan and keeping an eye on the refrigerant levels can go a long way. So can inspecting the wiring and the condenser.